Monday was a public holiday here as well as being smack bang in the middle of school holidays. In the afternoon the kids were a bit fractious so Phil took them to the skate park to burn off some energy while I finished some chores at home. I decided to surprise them all with a nice dinner outside on the lawn. I moved the table all of a huge 4 metres onto the lawn (rather than on the paving under the pergola) and it made all the difference. We were surrounded by greenery with little solar powered lanterns hanging in the frangipani tree and surrounded by flowers. 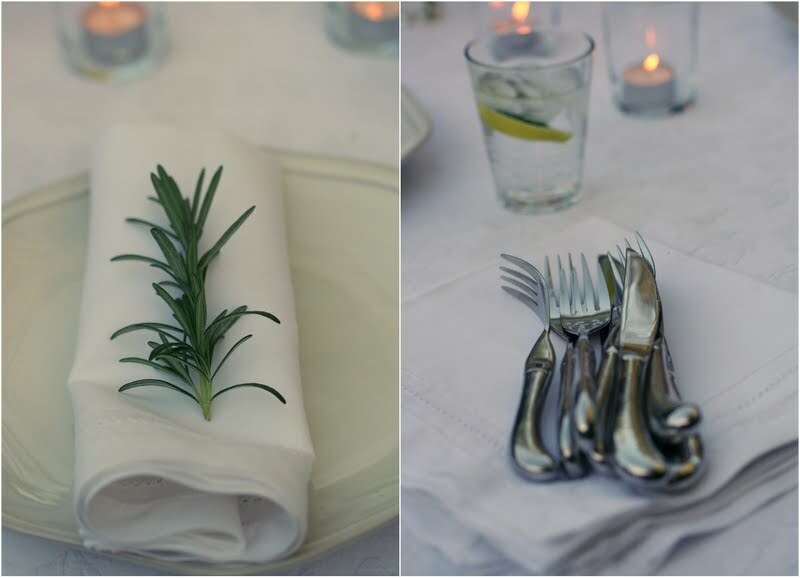 I laid a very simple table -white damask table cloth, white linen napkins and a sprig of rosemary plucked from the near by herb pots. Little tea light candles in IKEA glasses and old jam jars and some fading poppies in little glass bottles. 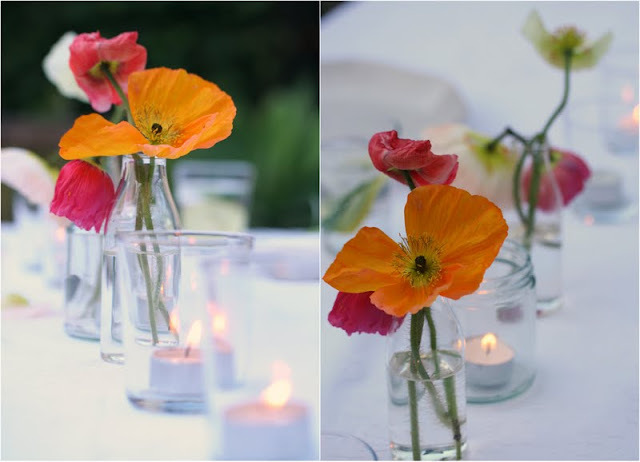 It's funny how simple things gathered from around your home can transform a table. How huge are those snapdragons in the background. I can't quite believe them. And I'm amazed what some watering can do for the lawn, my dad looked at the photo below and thought I'd enhanced the grass digitally! The photo is untouched, we didn't even fertilise the lawn this winter. I've just been making sure I give it a little water twice a week if it doesn't rain and it's made a world of difference. 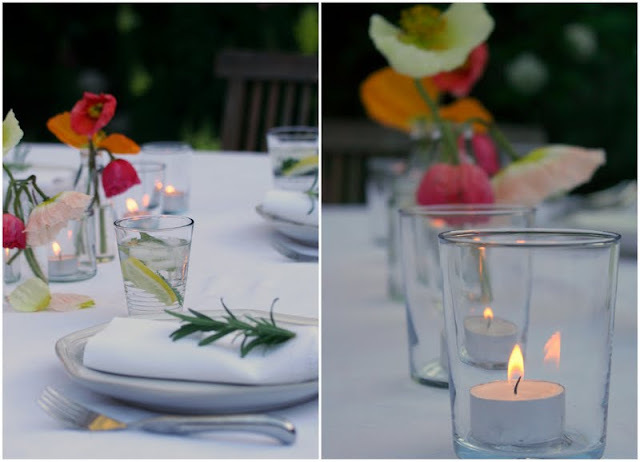 We had such a lovely evening sitting out in our garden with the fading light. It's still early Spring and we needed blankets on our laps but we stayed out there for ages talking, laughing and having a special family time. Everyone was so relaxed and happy and that happiness spilled over to today as well. I had cooked such a simple dinner of seasoned chicken thigh fillet, a roasted mix of different types of sweet potato; and some plain baby spinach (no dressing even). It was nothing special but just moving the table to a different location and doing a little table zhooshing, made it feel like we were at an expensive restaurant. I'll be doing that more often as the weather gets warmer. Do you dress the table for dinner? If you've got a photo of a recent special table setting, why don't you post it to my facebook page. I'd love to see it. Thanks for the mail. I am now a "reply blogger" thanks to you. I love all your tips re blogger by the way and am describing my posts properly for the purposes of SEO thanks to your help too. No worries re the meet up. I'd love to "do the Shops' when you are up this way. PS just spent two nights at Pittwater YHA on the western foreshore. You and your family would love it. I am so relaxed after it. I'll blog next week and you will see what I mean!!!!! Very pretty Fiona, it was nice to see a pic of your garden. To answer your question, that would be a no. I have a lovely collection of vintage tablecloths and napkins inherited from my Grandma. Some of them are still starched like they are brand new, which makes me hesitant to ever use them, I don't know why, these things aren't much good hidden away in a cupboard, are they! I have continued the collection with op shop finds, mainly embroidered tablecloths and doilies, but I guess they say 'afternoon tea party' to me more than they say dinner. Have a good day...we are heading down to the lake with some friends this morning. Fiona, you have inspired me, your table setting is all so lovely. I'm going to do something special this weekend. I love the little touches you have included. such perfect attention to detail as always. BTW your garden is so verdant and lush. It looks a perfect sanctuary. this is beautiful! you have a lovely garden. Looks great Fiona. In fact all your photos do lately. Have you got a new camera? Love all the fresh flowers. looking forward to your posts about how you paint - esp here in Aus where we can't always get what those in the US recommend. Very pretty and simple. I really like that. What a beautiful setting you have. Enjoy your week! Your table is lovely. Less is almost always more. Oh how pretty! What a lovely way to make dinner extra special!